0.9.12 works like a charm! Same over here. Problem solved I guess. hallo, de berekeningen kloppen niet altijd, ik gebruik better logic om een lamp te dimmen, maar de dimmer verwacht alleen 2 cijfers achter de comma 0.00-1.00 . wanneer ik 0.05 increment doe of decrement krijg je een getal in mn variabele van 8 cijfer achter de comma bv . 0.499999999. daarmee kan ik niet dimmen.er komt een foutmelding. dit was al voor de laatste updates. het zou heel fijn zijn als u hier tijd hebt om er aan te werken. This is indeed something that is there for a long time, even the buildin logic cards of homey have this problem. Is there some list where I can see the functions of better logic? Is it possible to create an array in a better logic variable? Found something that works, using mathjs with ROUND. 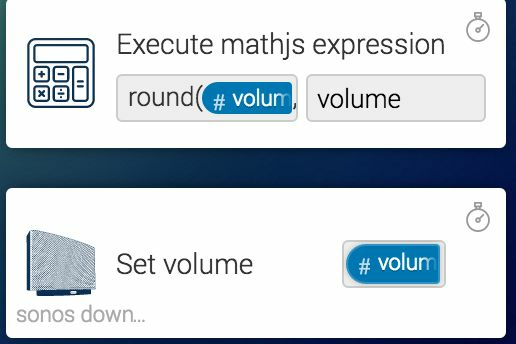 When my 'volume up' flow triggers and set the 'betterlogic' variable to something like 0,00000003 my second flow that set the volume (triggered by 'a variable changed', in my case 'volume') I'm using the mathjs card to do the rounding of the variable before its passed to my Sonos system. Can I do an "if" in Better Logic/Math.JS? I just want a value to increase until it reaches 1..
Its for a "slow" dimmer so I want increments of 0,05 until 1 but I need it for 3 lamps and they need to run so lap one starts before lamp 2 and 3 - and I want to integrate it into 1. flow instead of making 3 flows.. I was looking for a statement that just adds 0,05 if the number in the $variable$ is less than 1.. I'm new to Homey and trying to support my lighting system that uses arrays (actually objects but arrays would suffice) and I wanted to be able to pass these between functional blocks and maintain a state array and an ID mapping array too. However .. you make an excellent point that without other capabilities in Homey to do the manipulation , it's a pointless feature, so let me withdraw this request, at least for the time being. HomeyScript offers a possible solution although I'm not yet sure if I can read/write BL variables (or even Homey variables) from that. I also have some problems with the asynch nature of the scripts, but as I said I'm quite new to Homey (and JS). I will explore writing my own app too. I'm anxious about the number of flows I have to create to achieve things that are related. BL helps a lot but the overall flow model seems flawed. Something like Node-RED would seem much better suited. I'm looking at hooking in/out of that too. Great job with BL - many thanks for all the work you've put in on this and the ongoing helpful support. Now i want to store time like 11:30 in a variable and use this as tag in a flow, is this possible? Is it possible to change a variable without the corresponding BitFlip-device triggering flows? I have several flows which are triggered by automatically (by movement, sun events, time, etc.) and can be triggered by using a BitFlip-device. When the flows are triggered, the BitFlip isn't changed so I can't see the current state in the app. But when I change the variable from the automatic flow, the device is triggering flows as well. Although this might not seem like a problem (since the flow had to be triggered anyway), I have some flows where I want a distinction between automatically triggered and manually triggered. Currently, I just disable some flows when I set the variable and enable them afterwards, but it would be nice if I could change the variable without the device triggering (but have the device change according to the variable). Maybe a new card: 'Change variable without trigger'? One Flow for the BitFlip-Device and a second Flow for doing things that Homey should do. 3-Seconds-Delay: Tested it out and with 3 seconds it works perfect for me. In that way you could trigger the Second Flow with the BitFlip-Device and from other Flows/Actions > The BitFlip-Device will shown (after 3 seconds) the correct state. I have added a bitflip device, but when I change the variable to false or true in Homey it isn't changing on my android app. Any ideas? Now the first flow is working fine when I press the Bitlfip device on my mobile phone. The problem is that when I do a voice command the TV is turning on & off fine but the bitflip device is not changing. Although it is changing in the settings menu so it looks like the flow is correct. Maybe I miss something? Edit: After a fresh reboot everything is working fine! Also, how can I use a variable token from the When column in the Then part, when the variable hasn't changed? You can not. I can see if this is possible to implement. Not sure though. I have some flows where I would need the ability to check if a variable not changed. Are there any news on this? I haven't found something in the forum. Is it possible to shift the content of an string variable to another string variable, e.g. content of T2 to T3, T1 to T2, T0 to T1? I'm totally new with Homey, just started yesterday. 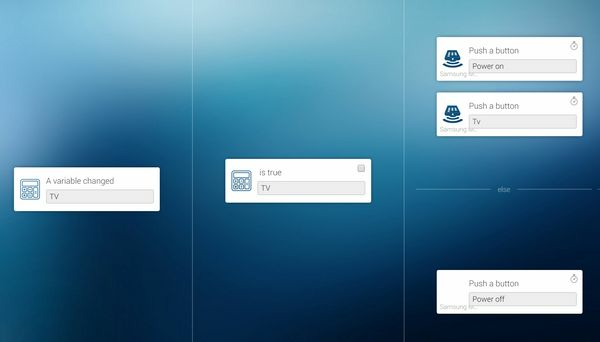 As a former Fibaro user I used a lot of variables in my scenes, that I now miss in Homey. So I really want to try this app. I've stranded on the install. "message": "should be equal to one of the allowed values"
"message": "should match exactly one schema in oneOf"
Am I making a noob mistake? What firmware version are you on? Are you installing via the appstore? Ow how stupid of me, I was looking in the appstore under the wrong name. I was trying to install it via Node, that didn't go well. I now installed it via the Appstore. Let's see if this will help me make some flows for my rollerblinds.